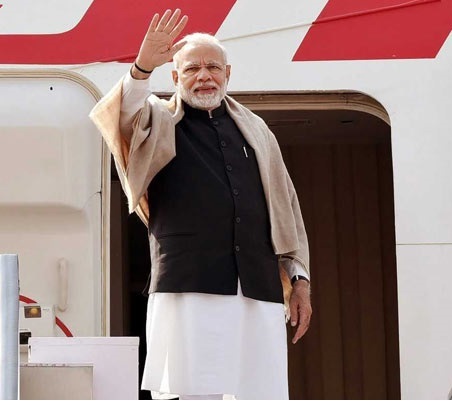 Prime Minister Narendra Modi has started his three-nation tour on Friday. PM Modi will visit Palestine, United Arab Emirates and Oman. This tour will be ended on Monday. With the trip to Palestine, he has become the first ever Indian Prime Minister to visit this country. He will meet President of Palestine and hold talks on relationship between India and Palestine. Palestinian President Mahmoud Abbas welcomed PM Modi and called this meeting a significant one. During Indian PM’s visit to Palestine, the following things are on the agenda. At the memorial for the iconic Palestinian leader Yasser Arafat, Prime Minister Narendra Modi will lay a wreath. Yasser Arafat was head of the Palestine Liberation Organization. In Palestine’s capital Ramallah, PM Modi is likely to announce the set-up of a super-specialty hospital today. At the working lunch, PM Modi will hold discussions with President Mahmoud Abbas and there will be discussion on exchange agreements. The aim of this visit is provide infrastructure and facilities that are not available to the people of Palestine. As per the policy, India aims to make this nation empower and independent. What did President Abbas say about PM Modi? We believe in the importance of a possible Indian role… to reach a final agreement based on international consensus and resolutions, in which India and other countries can be part of.